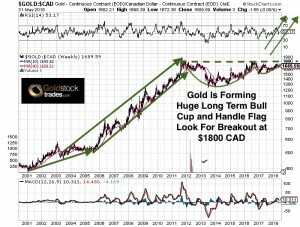 Incidentally, right now gold has been basing for almost 7 years while the majority of short sighted investors chase momentum into bubble like areas in financial stocks, tech and housing despite the record valuations and despite the warning of a market that has been on its longest run since the roaring 20’s which preceded the Great Depression. It was the late 90’s and I was graduating from high school and at that time the US dollar and stock market were quite strong as we were in the midst of the dot com bubble. Looking over the charts with my Dad who was a trader since the 30’s we saw a complete lacking of investment in gold and the junior mining explorers after the 1997 Bre X scandal. Gold went below $300 an ounce and there was no money funding the explorers. The stocks drifted lower to pennies per share. That is when I decided in my late teens to dedicate myself to this sector as I expected another gold rush. One thing you know is that gold and silver always comes back. I went to the Mining Conferences in NYC investing in the sector and started studying metallurgical and chemical engineering when guys like Rob McEwen and Rick Rule were still relatively unknown. Then as gold turned higher following the terrorist attacks while I was in college, my little penny stocks went to dollars and some got bought out and became part of majors. For many months we have been warning about increased volatility (NYSEARCA:VXX) and the rising risks of additional flash crashes as the Fed raises interest rates. I am still following that thesis and expect gold(NYSEARCA:GLD) to once again come back into favor as delinquencies rise and foreclosures increase. One area that has recaptured the attention of the mainstream in the success of Eric Sprott and the new gold rush in Western Australia. See my recent Seeking Alpha article discussing the new gold rush by clicking here… Take a look at this little junior which Eric Sprott just invested some big money into right next to Novo and is a featured company. In other news, a little junior I featured a few months ago when it was trading at pennies has just broken through the $1 mark on a world class lithium discovery. A few months ago when I first did the interview many analysts were skeptical now the big banks have jumped on board. Its good to stay ahead of the curve here so make sure you sign up for my free newsletter! Its very important we still look at silver (NYSEARCA:SLV) which should outperform gold once we see a precious metals breakout. Recently the ratio hit 80 to 1 which is usually a point where the mining sector hits bottom and turns around. Its only a matter of time before this sector bottoms and when this finally occurs look for the silver stocks to outperform. At current silver prices producers aren’t making profit. While I wouldn’t want to be a producer I may want to hold onto some great US silver assets. Between 1987 and 1990 Tenneco Minerals completed a feasibility study after an intensive drilling campaign and announced plans to construct a $35 million mill at this property before the recession in the early 1990’s. Now a little junior which I featured many months ago has published an updated resource which can be found here. The Mineral Resources were estimated from 133 drill holes, 19 of which were drilled by this little junior in 2016 and 2017. Finally, I plan on attending the 121 Mining Conference in NYC next week. Don’t delay, join over 200 of your investment peers including myself at New York’s largest mining investment summit. Register here! Disclosure: Jeb Handwerger is not a registered investment advisor! Junior Mining Stocks are very risky! Buyer Beware!